I’m so, so full of joy that America elected Obama. He didn’t win because he was black – people voted for him because he had a plan and because he talked sense and because you believed him. Conservatives, they’re like the Republicans to me. They don’t do much. They have this whole hierarchy and boys’ club thing going on. That doesn’t help the regular person. I never do a show where the people just sit there and look at me. They always sing along. It’s going to be a fun time. I like to write about the things I care about. It’s no fun to sing about things you don’t like. Collaboration is the way to go. It’s very timely and fun to do. Estelle Fanta Swaray was born in Hammersmith, London, England. 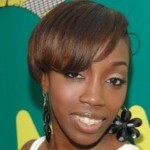 She, simply known as Estelle, is a British singer. She is known for her eclectic mix of various musical genres including R&B, soul, reggae, grime, hip hop and dance. In 2009, she won a Grammy Award for her song "American Boy" featuring Kanye West in the category Best Rap/Sung Collaboration as well receiving the MOBO for 'Best Newcomer' and received three consecutive 'Best Female Artist' trophies from the UK Hip hop Awards. Her albums list shown below: Shine, True Romance, All of Me, and The 18th Day.